This year’s BeerHoptacular beer tasting festival will take place November 8 and 9 at the Lacuna Artist Loft Studios in Pilsen. The festival was first announced for Nov. 1-2, but has since been shifted back a week. BeerHoptacular is a craft beer festival with an additional focus on DIY homebrewing. Each year a Homebrew Challenge runs alongside the tasting event. Also, attendees vote on the Beer of the Year. Last year’s winners were 5 Rabbit’s 5 Lizard, Lexington Brewing and Distilling Company’s Kentucky Bourbon Barrel Ale and Brewery Ommegang’s Art of Darkness Ale. 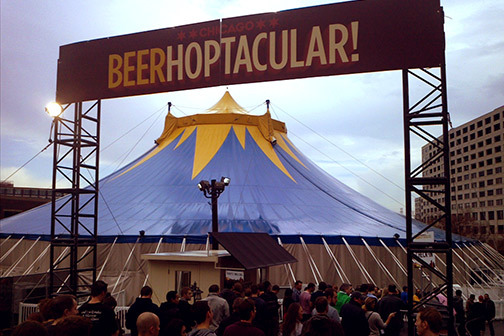 BeerHoptacular, now in its fourth year, was previously held in Aragon Ballroom in Uptown and most recently at the Riverfront Theater in River North.